Meet Mark, he likes bees! Meet Mark Berman! He’s one of the bee masters at Bartram’s. Where are your bees and how did you get started? I have two hives down by the Sankofa Community Farm at Bartram’s Garden, this is my third season there. 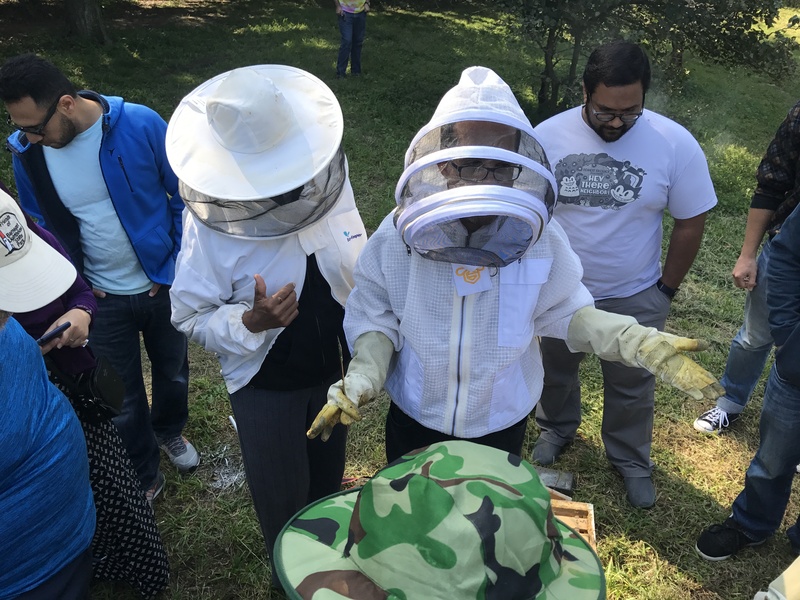 I learned how to keep bees through the Philadelphia Beekeepers Guild – they have a three-day course over the span of the summer months that teaches you everything you need to know to get started – the rest is up to hands-on experience. Can you tell us about some highs and lows regarding beekeeping? I started by ordering a package of bees and they’ve survived two consecutive winters until they were vandalized. I was able to salvage one colony and split it into two. What are some benefits to having bees at Bartram’s? The bees have everything they need at Bartram’s – a diversity of plants, flowers and trees to forage and water from the river. The honeybees will forage up to a three-mile radius on average. They typically start foraging in early spring when temperatures rise above 50 degrees. They forage for nectar (carbohydrates) and pollen (protein) which they gather and bring back to the hive. They drink nectar from the flowers using their proboscis, storing it in their “honey stomach” – called the crop – and regurgitate it to a house bee at the entrance of the hive who stores it in a cell in the hive, on a frame of wax comb (“honeycomb”). What happens once nectar and pollen are collected? The bees fan the nectar to reduce it to 15% water content then seal it with wax and it becomes honey, to be used as food over the winter when there are no flowers to forage and it’s too cold for bees to travel outside their hive. The bees pack pollen into ‘pollen baskets’ which are simply combs or hair that the pollen gets stuck to on their back legs. They bring this back to the hive and pack it away in cells as well. Newborn bees eat a mixture of nectar and pollen called beebread. Tell us about some in hive shenanigans that we might not normally see? There is only one queen per colony – she is the only bee in the colony that lays eggs. There may be 30,000-60,000 bees in a colony. The queen mates with male bees – known as drones, which do not have stingers – drones exist only to mate with queens OUTSIDE of the hive in midair during flight. The queen will go out on mating flights at about 1 week old, fly to a “drone congregation area” where drones mysteriously know to fly to in order to mate with a queen – and then the queen will mate with 5-10 drones in flight. The queen mates with drones from many different colonies which improves her offspring’s genetics. What do you most look forward to during Honey Fest? I give an open hive demo to show folks what happens inside the boxes and explain the colony’s behaviors through the seasons. I look forward to answering people’s questions because I also learn a lot about the bees that way. My particular interest is also in the biology of the honey bee. I still have a lot to learn but I love sharing info about the bee’s anatomy and behaviors. My daughter Anna also helps me with the bees so it’s a family affair and she enjoys volunteering, discussing the observation hive at the guild’s info table and selling our honey, Anna Bee’s Honey.